So, What About Mitt Romney’s Post-RNC Poll Number Bump? 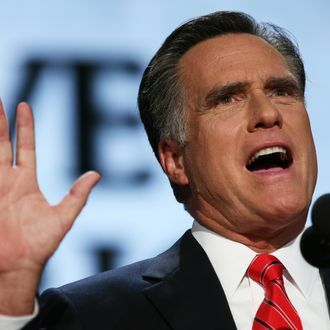 As part of the campaign’s regular Lower Your Expectations refrain, Romney chief strategist Stuart Stevens told a planeload of reporters on Tuesday that 11-point boost Mitt Romney had once expected from the Republican National Convention was unlikely. “I just think all bets are off about any kind of past performance being a predictor of the future,” he said. But as political scientist Tom Holbrook has found, there’s really no such thing as “past performance” when it comes to convention-generated numbers: consider Barry Goldwater’s 16-point spike in 1964 versus Barack Obama’s 1.8-point twitch four years ago. (Holbrook himself predicted a 3.8 point bump for Romney.) This Reuters/Ipsos rolling poll — released just before Romney’s (and Clint Eastwood’s) speeches — had the GOP candidate up two points (from 42 to 44). As of yesterday, Gallup put a post-speech Romney at 46 — exactly where he was on August 22nd. So, What About That Romney Convention Bump?